Our Innovation Practice Group on the 22nd November last was a really great event, with an excellent mix of information sharing, plant tours, and networking. The facilities and processes at Medtronic are a credit to all the team and it was great to have the opportunity to see firsthand the operations and R&D areas. It was also interesting to see how the Galway Management are positioning the plant within Medtronic Global and no doubt when the Customer Innovation Centre is open it will provide a real strategic asset in Galway. The openness to share knowledge and practices around R&D was immensely appreciated and provided some great insights for our guests. Finally, the hospitality was just exceptional. A very big Thank You to all the Galway team. 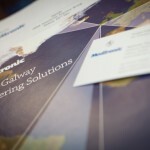 We had a great mix of companies in attendance again, across every sector, size and part of Ireland.